Provide a pleasant and healthy environment. Conserve historic, cultural, and natural resources. Integrate economic prosperity, ecology, and aesthetics. Use land and infrastructure effectively. Continually evaluate and refine shared vision and goals. The Saginaw Bay Watershed Initiative Network (WIN) was created to enhance the quality of life in the Saginaw Bay Watershed by creating regional networks of on-the-ground projects that demonstrate sustainability. These projects link economic, environmental and community goals. The partnership includes communities, conservationists, foundations, and businesses working together to balance the region’s economic, environmental, and social goals. 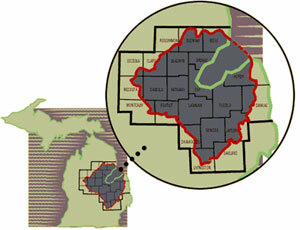 With nearly 8,700 square miles, the Saginaw Bay Watershed is home to 1.4 million people. The watershed provides habitat for many species of wildlife. All or part of 22 Michigan counties contribute to the watershed’s 7,000 miles of rivers and streams, which contain more than 90 species of fish. In addition to supplying water to the wildlife, residents rely on the watershed for recreation, irrigation, electrical power generation, industrial processes, and drinking water. The Saginaw Bay Watershed is one of Michigan’s most diverse areas—its rich resources support agriculture, manufacturing, tourism, outdoor recreation, and a vast variety of wildlife. It is also Michigan’s largest watershed and includes all or part of 22 counties and America’s largest contiguous freshwater coastal wetland system. This wetland extends along the shores of Saginaw Bay and provides habitat for large populations of waterfowl, birds, and more than 90 fish species. The watershed also features more than 175 inland lakes, about 7,000 miles of rivers and streams, and drains approximately 15 percent of the state. Significant agricultural and industrial resources supporting Michigan’s economy. The Saginaw Bay WIN is a voluntary, non-regulatory partnership created to protect this special place. Communities, conservation groups, foundations, and businesses are working together to enhance the Saginaw Bay Watershed and create a more sustainable future for all of its inhabitants. With the initial leadership of The Dow Chemical Company and ongoing facilitation from The Conservation Fund, WIN has brought people and resources together to balance environmental, economic, social, recreational, and historic priorities, and to leverage ideas and resources toward a common goal—the greater good of future generations. WIN has launched projects to protect and restore habitat, improve access to natural resources, foster nature-based tourism, inform people about nonpoint source pollution, and support sustainable agriculture.